Have you made your picks? What are you waiting for? This week’s winner will receive two tickets and a parking pass to Arrowhead for the Chiefs’ game against the San Francisco 49ers on September 23. 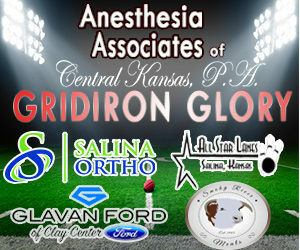 Don’t miss out on the fun — and the glory — of winning Chiefs tickets at Arrowhead, $1,000 in cash, a trip to Hawaii, and more with Anesthesia Associates’ Gridiron Glory. Just go to the Contests tab on SalinaPost.com and make your picks each week. If you haven’t signed up yet, click here to get started. Don’t miss out on the fun….and the glory!